An Affidavit of Heirship form is a sworn statement taken under oath by one or more members of a family. 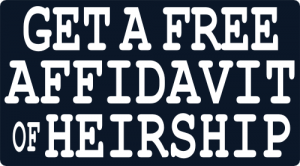 Heirship Affidavits are legal documents used to establish the heirs of a person who has died without a will. An Affidavit of Heirship must be affirmed by at least two witnesses who were familiar with the Decedent, but do not stand to benefit from the estate. In the Affidavit, the heirs and witnesses verify that the Decedent has passed away and that the Decedent has no outstanding debts. 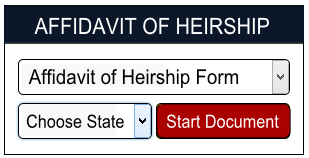 Fill out a free Affidavit of Heirship in just minutes online. When is an Affidavit of Heirship Form Needed? An Affidavit of Heirship is most often used in cases where the Decedent did not leave a will. The Heirship Affidavit must be recorded in the county where the property lies, signed by all parties and notarized by a notary public. An Affidavit of Heirship form is used as an alternative to the probate of real estate. The use of Heirship Affidavits instead of probate is a common formality accepted by title insurance companies. If a title insurance company issues an insurance policy for a piece of property, it is most likely that there is good title to the property, even if there is an unprobated estate in the chain of title. The main goal of an Affidavit of Heirship is to give the title insurance companies a mechanism to issue the title policy. When a person passes away without a will and leaves property titled in their name, the property is permanently attached to the name of that deceased person. Most of the time, the property will go through the the probate process to get the deceased’s name removed and transferred into the name of the living heirs. There is an exception when real estate is involved that permits the heirs to keep the real estate out of probate. The exception is for the heirs to file an Affidavit of Heirship in the county that the property is located. Follow the link below to our quick and easy online template and get a free state specific Affidavit of Heirship form. Just have your information ready and print the document online.